Why Choose Scuba St Lucia? Jade Mountain and Anse Chastanet are pleased to jointly feature our premier scuba and snorkeling operation, Scuba St. Lucia, as one of the most scenic and ecologically rich locations the Caribbean has to offer – including an easily accessible coral-rich dive and snorkeling site right off shore. Scuba St. Lucia is part of our 600-acre resort estate voted to be one of the Top Five Caribbean Resorts by both Travel & Leisure and Conde Nast Traveler magazines. The picture postcard perfect views of the famous UNESCO-designated landmark mountains, the twin Pitons, are one of the many compelling reasons to stay and dive here. 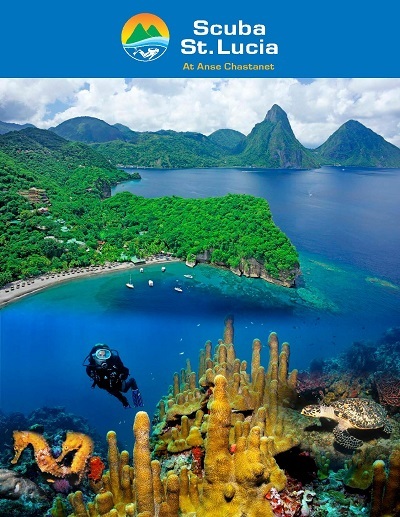 Situated in the heart of St. Lucia's world renowned Soufriere Marine Management Area Marine Park and founded in 1981, Scuba St. Lucia has established itself as one of the Caribbean's top diving destinations with a focus on having fun and ecological awareness – a corner stone of our resorts' mission. Scuba St. Lucia is situated just steps away from Anse Chastanet beach - perfect for both beach and boat dives, with a complete range of guided activities and PADI courses. Our well-equipped scuba store includes three compressors, rental dive gear, conference room equipped with any needed equipment and an underwater photo and video center. Scuba St. Lucia is more than a premier dive operation. In keeping with the resort's sustainable no-impact goals and LEED Gold Certification, our center also walks the walk as the proud owner of the PADI Green Star™ Dive Center Award and 100% Project AWARE Partner, identifying dive businesses that care about the environment and are acting to protect it. The PADI Instructor Development Course (PADI IDC) is the leading instructor training program in the recreational dive industry. Candidates undertaking the PADI IDC have the choice of completing the full program in one course, or taking the program in two parts - the PADI Assistant Instructor Course and the PADI OWSI Program. Upon successful completion of the complete PADI IDC or PADI AI Course and PADI OWSI Program), a candidate will be eligible to attend a PADI Instructor Exam. Once this step is successfully completed, you'll be ready to be certified as a PADI Open Water Scuba Instructor. During the PADI OWSI Program you'll be exposed to a wide range of topics and workshops that will prepare you to be a great dive instructor. You'll learn about the dive industry, risk management, the business of diving, and how to conduct a wide range of PADI Programs. You'll learn how to teach in a variety of contexts, including knowledge development and skill development in the classroom, confined water and open water. When you complete your IDC you'll be qualified to attend the PADI Instructor Exam. After becoming an Open Water Scuba Instructor, you will be able to conduct the entire range of PADI programs from Discover Scuba Diving up to Divemaster. You may also choose to acquire specialty instructor ratings in areas of interest, such as Deep, Drift, Dive Against Debris, Enriched Air, Invasive Lionfish Tracker, Search and Recovery, Naturalist, Night, Wreck, etc. Being able to offer these courses at a dive shop is a huge attraction to customers and makes your resume more impressive! Have been a certified diver for at least six months and have completed and logged at least 60 open water scuba dives (as documented in the individual’s log book) and have documentation of experience in deep, night and navigation diving. To be certified as a PADI Open Water Scuba Instructor you'll need to complete the full PADI IDC, show proof of having logged 100 dives, and complete the PADI Instructor Exam. Prior to final certification, you'll show proof of being a current instructor in first aid and CPR. We recommend the EFR Instructor Course to meet these requirements. 26 Aug 8am EFR Instructor course – a.m.